I am a baker, live in Bombay with my husband and his family plus two beagles and run a small food brand that I hope one day will be world famous. I have been reading food blogs for over a decade now and in the past few years have tried to start one several times only to fail repeatedly due to lack of commitment. This year I want it to be different. Simply because I only made one resolution for 2018- to be consistent. So, I think this blog will be a good yardstick to measure whether I stayed true to it or not. I have also been meaning to improve my food styling + photography skills and I figured this will be a good spot to check my progress. I will also share good recipes so that the few of you who do stop by, don’t do it in vain. And now as promised, a great recipe to start us off. If you are a lazy person like me, you are going to love baking galettes instead of pies. Galettes are the down to earth and laid back cousins of the more elegant, high maintenance pies. They are rustic, simple and beautiful in their haphazard appearance. I had a bag of plums withering away on the kitchen counter so I decided to bake a simple galette paired with almond frangipane and rosemary. I found a great recipe and only swapped the thyme with rosemary because that's what I had decaying in the back of my fridge (clearly I need to get better at managing my kitchen produce). 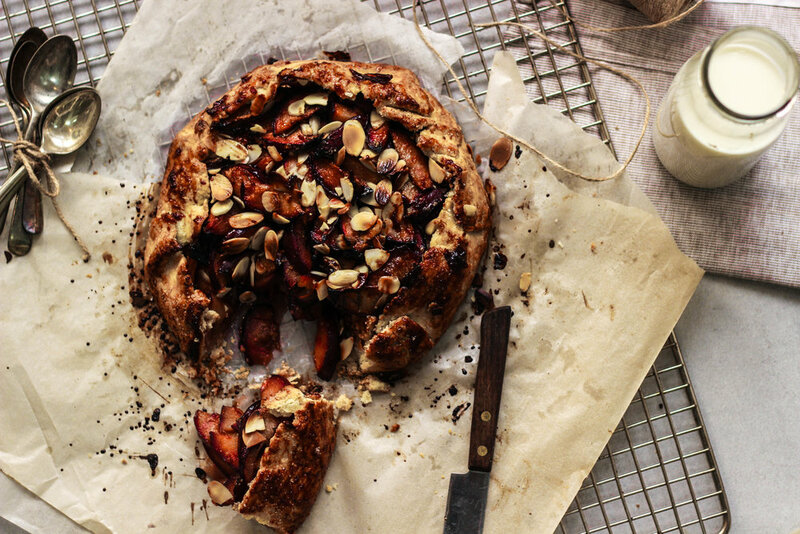 The pastry was flaky with a rich, buttery almond frangipane serving as the perfect foil for the little mountain of tart, sweet plums. I ate three slices(not even a little sorry) while laying in bed in my pyjamas watching episodes of The Marvellous Mrs. Maisel (seriously in love with this show) and couldn't think of a better way to spend Saturday night.